Its only a game, then why do I hurt? The Texas Rangers were so close, and yet so far. It has been a while since I have written, I now fully understand why sports writers learn to be objective, it hurts too much to be a fan. Yes, I want to be positive but its hurts when your team doesn’t go all the way. The post season is a magnification of what is wrong with the team. We were asking a great deal from all of our players. Many of them very much injured or coming back from injury. Yes, you might think its time to point fingers but the reality is, you don’t know how someone is going to perform until they get out there. Still, for me there was this hope and love that I thought they would make it all the way and when Game 5 hit I was convinced that was the end all be all, we were going to win. Oh that’s the problem when you give your heart away it get broken sometimes. I saw a tweet from a former MLB player. He talked about how the “bat flip”. That the Rangers fans need not to be angry at the bat flip that if Beltre had done it we would have applauded it. As a Ranger fan I was not offended by the bat flip, I was more offended by showing up my pitcher. Ranger fans are angry because we were so close and didn’t make it. This was supposed to be our year. We came back from last place, this was not how the story was supposed to go. The bat flip was the last straw. It just goes to show how much fans love the game. We see the players love on the field. Who didn’t get a little misty when Beltre came out and started to cry. As fans we take possession of the team, they are not the Rangers they are our team. While we didn’t play in the field we did cheer for you, buy the tickets, buy the merchandise, support your charities. We made an emotional investment in you. In the end after the tough loss of the series and going home, it hurts and no matter how much of a positive spin you put on it. It hurts. While the Rangers maybe over for the season they are far from over as an organization. Jeff Banister talks about how the playoffs were not a reflection of the whole season. Who would be on your Field of Dreams? Author Note: I can’t watch the Rangers game, so I am reposing this. I wrote it and thought it was fun. No one read it. The playoffs make you think of the past so for fun of all the past Rangers who would be my dream team. These are who I chose. Who would you choose? I am on Twitter, and one of my favorite all-time ballplayers, Frank Catalanotto, retweets from a Blue Jays fan. I saw that, and my brown eyes turned green and my Ranger fandom cried out, oh no, sorry Jays fan, if Frank is going to get a ring, it’s going to be a Ranger ring. He was a Ranger for a long time, and he came back to the Rangers after he left the Blue Jays. Doesn’t he looks good in a Rangers uniform? Then I thought, who would be in my Field of Dreams? I am standing in Iowa in a cut- down cornfield. Who would be my Ranger Dream Team? To play in a World Series game, to get a Ranger ring? Oh, my bench is impressive, too. Full of happy memories. Tell me, who would be in your Field of Dreams? Welcome MLB playoff fans! Come on in and sit yourself down. Someone get them a beer and a dog. For you Dodger fans, we have the classic Dodger Dogs. Here is a quick bio of Harry Caray. Do not go to WRIGLEY FIELD and not know Harry Caray. Baseball playoff season is upon us. In the NL, the Cardinals are already in. The Dodgers are in, thanks to Clayton Kershaw. The Mets are coming in from the East. A battle for the wild card is going on between the Cubs and the Pirates. Will this finally be the Cubs’ year? In the AL, the Blue Jays are in, as are the Royals, who have been dominant this year. There is a battle in the West for who will go on to win the division, who will play the Yankees in a one-game winner-take-all and who will just go home. Now here come the FANS. You know the fair-weather fans, the ones who about the end of August realize that people are playing baseball. They flip on the channel and suddenly become fans, watching the teams get better and better. The fair-weather fan comes into our house. For the die-hard fans, it feels like an invasion of privacy, and honestly, there’s a little bit of jealously. We suddenly become bitter girlfriends. I have always been a die-hard Rangers fan. But last year, with the Rangers nowhere near the playoffs, I turned my attention to my favorite player Jayson Nix. He was picked up by the Royals, and so I picked up my fandom and became a Royals fan. For the first time, I was a fair-weather fan. Social media and fandom can be a wonderful combination. I was embraced by the Royals fans online, forgiving me for being a Nix fan once they found out I met him and that’s why I cheered for him. The Royals went on an impressive streak, and the fair-weather and die-hard fans were sent into a frenzy. And I was so excited I even bought a shirt and had it customized for Nix. I like being unique. I wore my shirt proudly and was again embraced by the real Royals fans. High-fives and”love your shirt.” They made me a real fan, while the Rangers still have my heart. The Royals brought me back to baseball. Baseball can be an elitist sport sometimes. We have our own jargon and rules and no real reason of why we do things. Our job as the die-hards is to show the fair-weather fans what they have been missing, encourage and teach them all about what makes the team great. Let’s embrace the fair-weather fans, and maybe they will become real fans. Is this the year of the No Hitter? //platform.twitter.com/widgets.jsWell, congrats to Jake Arrieta for the no-hitter and for being the NL Player of the Week. That makes six no-hitters this season. It makes me curious about how many no-hitters there have been in a single season. We go to baseball-reference.com and find that there have been 12 by the old rules. But by the modern rules of a no-hitter, (which is simple: no hits, but walks, hit batters and errors still will qualify a pitcher for a no-hitter), the record is eight. There were seven in the years 1990, 1991 and 2012. The E4 that happened during yesterday’s no-hitter still counts. The Cubs have a unique distinction this year of being on both ends of no-hitters. Speaking of injured players, Derek Holland of the Texas Rangers made his case to management that he was ready, and boy howdy, was he right. He is looking amazing, and in his last outing, on Sunday, he struck out 11 in a nine-inning shutout. A no-hitter, that would be a great comeback story. The Royals have a great pitching staff, and they could very easily do this. I couldn’t even choose who would do it. If I had to choose, it would be Cueto, but I think anyone of the Royals starters could pull it off. The Mets have an easy schedule the rest of the season, and there could really be a great no-hitter opportunity. What is a pitcher to do after a no-hitter? He does what we all do after a long, hard day: Get into pajamas and relax. Except Arrieta got his whole team to join in, and at Dodger Stadium and on the plane ride home, the Cubs had a pj party. Confession time: I am an overthinker. When a problem comes up, I like to work out three solutions and think of worse-case scenarios. I have been like this my whole life, and it messes up my life. The same can be true for a baseball player — a slump at the plate, unable to find the strike zone, the ball just can’t find your glove. Some would say a solution is more practice, but sometimes a different solution may be in order: Just stop thinking and just play. Today, I read a wonderful article about how Texas Rangers outfielder Shin-Soo Choo’s wife helped him to stop overthinking. Shin-Soo Choo is very special to me. I watched him for a season as a San Antonio Mission. Before the All-Star break this year, Choo was not having a good season. He was even taken out of the line up. And then after the All-Star break, his numbers are a .333 batting average, .441 OBP, .607 slugging percentage and a 1.048 OPS. Choo’s wife used a building metaphor to describe his game. Buildings with a solid foundation can take whatever is shaking them. More importantly is the outcome of this advice. He stopped thinking and started playing and having fun. Baseball is a kid’s game. It should be fun. Sometimes, we need to not see what is going to happen next. Remember, the definition of insanity is doing the same thing over and over again and expecting a different result. Best thing you can do for your game: Stop thinking and just play. Q and A with Miss Baseball. Right now I am glad I write and don’t do a video log. I normally have a high Minnie Mouse voice and now I sound like a old lady that smoked for 20 yrs. As I am too tired and sick to give you all a real post I thought I would answer questions that people at random ask me. 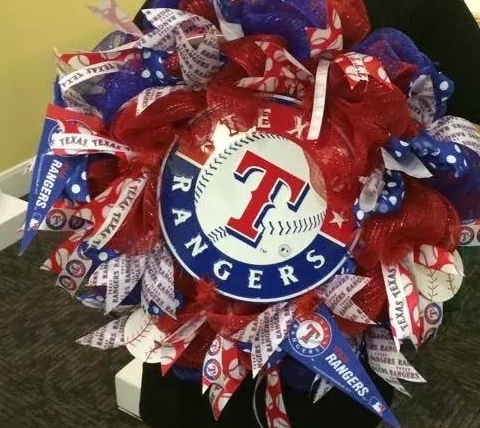 Q: I thought you were a Royals fan; Why do you have a Ranger wreath on your door? I was a Royals fan because my favorite player last year played for them. If it came down in the playoff between the Royals and the Rangers I would hope the Rangers would beat down the Royals. Q: You don’t have cable how can you watch all the baseball games? The MLB app is wonderful, I buy for spring training and I can watch every game during the season other than the Rangers and Astros live. I have to wait 90 mins after a game as ended to watch them because I am in their blackout zone. Q: You post a bunch of stuff about the Dodgers, what’s up with that? Thanks to being a part of the Kaplifestyle family, I started watching the Dodgers because of that. Now I watch the Dodgers because I am a fan. Q: You write a blog about baseball! Why? , whatever we call ourselves to talk about the game. There is so much sports news geared towards men, but women like baseball too. In my experience, I know more women who know more about the game than most men. the exception to the rule is unless you played at a professional level. Q: Do you talk to baseball players? I couldn’t do that I would be too scared. Sure! on Twitter mostly. They are not scary, they are people. Some are really nice, some are jerks. Treat them like a person and they will treat you like one too. Adrian Beltre gets his 3rd cycle and becomes a standout in history. History was made last night. Adrian Beltre of the Texas Rangers hit his third cycle. Only John Reilly, Bob Meusel and Babe Herman have done it. The last time it was done was Sept. 30, 1933. The even greater feat was that Globe Life Park, or as I like to call it, The Ballpark in Arlington, was home to all THREE of Beltre’s cycles. John Reilly had all of his as a member of the Cincinnati Reds. He had two in one week at Bank Street grounds in 1883. The next year, the Reds had a new home, League Park I, and Reilly hit his third cycle there in 1890. Adrian Beltre not only made history but now has become a legend, having done something NO ONE has ever done: hit three cycles in the same ballpark. On Sept. 1, 2008, he hit his first, as a member of the Seattle Mariners. On Aug. 24, 2012, he hit his second, this time as a Ranger, and on Aug. 3, 2015, he reached the cycle in five innings. Is a fourth cycle possible?